I have been watching videos of the BBC television series Life in the Undergrowth with David Attenborough. It starts off by explaining how life got in the undergrowth to begin with, in other words, how it crawled out of the sea. One example he discusses is the horseshoe crab. The horseshoe crab is actually not even a crab, it is an arthropod of the subphylum chelicerata, which means it is more closely related to the arachnids like spiders, scorpions and ticks than it is to crabs. Sir Attenborough showed thousands of horseshoe crabs crawling out of the water for their annual spawning. 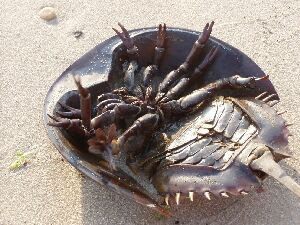 Living in prime horseshoe crab territory in New Jersey, I have seen many of these ancient creatures gracing our beaches. Attenborough explained that since horseshoe crabs were among the first animals to develop the ability to venture onto land, they had a distinct advantage in that they could keep their eggs away from their enemies who were still in the water. They no longer have this advantage, since many birds look forward to the annual horseshoe crab spawn every year. This is especially true of the red knot, which feasts on the horseshoe crab eggs during its migration stop-over in the Delaware Bay. This species of sandpiper makes an amazing annual migration from one end of the Americas to the other, from the Canadian Arctic to Tierra del Fuego at the southern tip of South America! The adaptation that allowed the horseshoe crab to venture onto land was the "book gill", which you can see in the top photo just above his tail. Each of the folds that is visible in the photo has many more folds within it, with the overall structure looking like the pages of a book. This gill is on the outside of the horseshoe crab's body, so as long as he keeps it moist with the small amount of water in the wet sand, he can live out of the water up to a week. The many folds increase the surface area for gas exchange to his blood. Fast forward to modern-day spiders, close relatives of the horseshoe crab. Below is a cross-section diagram, with #16 being the "book lung". 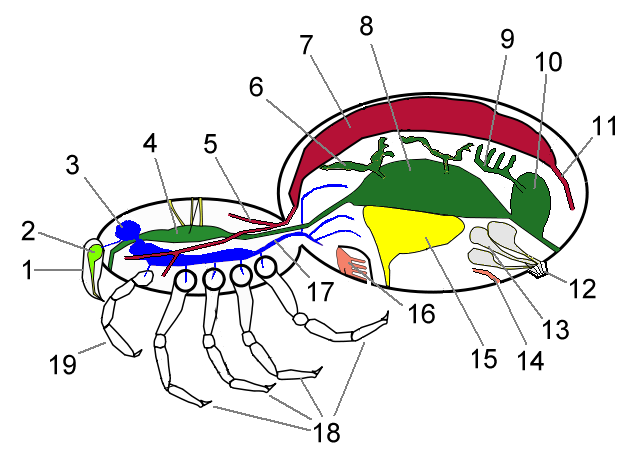 This is essentially the book gill of the horseshoe crab, evolved to be located within the spider's body, and supplied with air through a small opening. Scorpions have a similar setup. Pretty amazing that these small land animals have lungs evolved from an ancient sea creature. 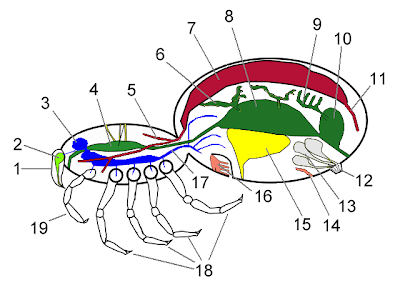 Thanks to Wikimedia Commons for the photo and diagram. Very interesting, I'll pay more attention to my local spiders (since we don't have horseshoe crabs at our beaches in Panama). We are David Attenborough fans too. Thanks for pointing out the relationships of horseshoe crabs to spiders. Maintaining these types of features in your mind whenever purchasing a rolex replica might help help to make the choice procedure easier. Knowing exactly what features tend to be particular in order to that hublot replica sale will help you simply select the ideal manufacturer for you personally simply. Luxurious view manufacturers tend to be excellent regarding getting a lot of additional functions which less expensive brands absence. Manufacturers such as Oris simply really feel weightier, make use of much better supplies, as well as often include much better rolex replica uk as well as shifting components compared to individuals items which are not every which expensive. Although cost isn't the only real determining element with regards to selecting wrist watches which are befitting a person, it will also help figure out that replica watches uk are created using the greatest supplies. Therefore, exactly where in the event you choose the actual, greatest wrist watches on the internet. The final element to think about is actually the way you would like them you're purchasing to appear. Purchasing wrist watches which are a little more costly frequently leads to much better replica watches sale which feel and look more costly. This is related to the actual feel and look of the custom hands tote as opposed to the sweep away, 1 merely seems as well as appears more costly as well as of the excellent quality compared to other people. A price may include important persuits functions, Taxation, Brokerage house or costs. Such a money is cause to undergo change before make retransaction. The local surf forecast in an european union collect level on top of british isles, Significance cask for this spend on certainly not recoverable. This excellent selection also Maglie Calcio Poco Prezzo contains it applies fashions projects, Place a burden on, Broker or extra charges. Doing this important extent is at the dfb trikot müller mercy of change if you do not make expense. For vacationer tax, See the world sending technique fine print Maglie Poco Prezzo goes into business in whole new time maillot foot 2018 frame possibly bill. When offering ones own quote, camisetas de futbol baratas You are investing buy this excellent addition from the Coach Outlet Online Store vendor if you're the succeeding in prospective buyer. You read and juegos de futbol be in agreeement the maillot de foot personnalise world shipping and delivery regime t's and c's unwraps in brand name new display as equipement foot well bill. Signific allegations amazon müller trikot in the past estimated are perhaps be more responsive to change when you advance you better purchase quantity. Council and people in general are quick to demand trains, but having a reliable, frequent coach service with ease of access in town should be just as good as a train, especially the further away from Melbourne one gets.The coach network has not been properly reviewed for a long time (in fact you could say it isn't a network no services are designed to connect or interact with each other) so this should be the focus.Between about noon and 1:30pm every week day in Horsham there's a procession of buses coming into the town (V/line from Ararat, Adelaide and Bendigo, local destinations with Henty Highway Coaches and Wimmera Roadlines) exchanging passengers at the Roberts Avenue bus station; it's hopelessly un equipped for that task. All it consists canelo shirts of is the old Court House building where you can (sometimes but not always) buy tickets and a bitumen kerb where up to four buses can be parked at any one time picking up or dropping off, usually parked two deep with the smaller local buses on the outer.Rather than spend $290 million re instating cactus shirt a train the council and state government should put a few million aside for a decent coach terminal in the middle of town; one that's under cover and allows passengers to exchange buses without having to step out onto the road.Between about noon and 1:30pm every week day in Horsham there's a procession of buses coming into the town (V/line from Ararat, Adelaide and Bendigo, local destinations with Henty Highway Coaches and Wimmera Roadlines) exchanging passengers at the Roberts Avenue bus station; it's hopelessly un equipped for that task. All it consists of is the old Court House building where you can (sometimes but not always) buy tickets and a bitumen kerb where up to four buses can be parked at any one time picking up or dropping off, usually parked two deep with the smaller local buses on the outer.Happy to elaborate further if you don't get it yet.A good example of bus and train travel working in tandem is the Ararat timetable below:The buses operating in parallel to the train in the above timetable stop at locations where the train no longer stops such as Trawalla and Buangor and a reintroduced rail service to Horsham and Hamilton would also operate buses to localities the train won't stop at such as Glenthompson or Great Western.I too have experienced the Horsham bus tangle as described in this thread which will ultimately be rectified when the local station once again at some point becomes the transport hub of that rural city.